A month of harvesting and preparation at Homeacres as summer comes to an end. The recent wet and gloomy weather has highlighted the memories of a brilliant summer for growing, we have been lucky here, and I hope it has been good for you. If so, you have harvests to make: some vegetables need picking now, to store, and some can be left for fresh harvests through winter. Now is time for garlic planting, and salads undercover. Wait until November to sow broad beans. 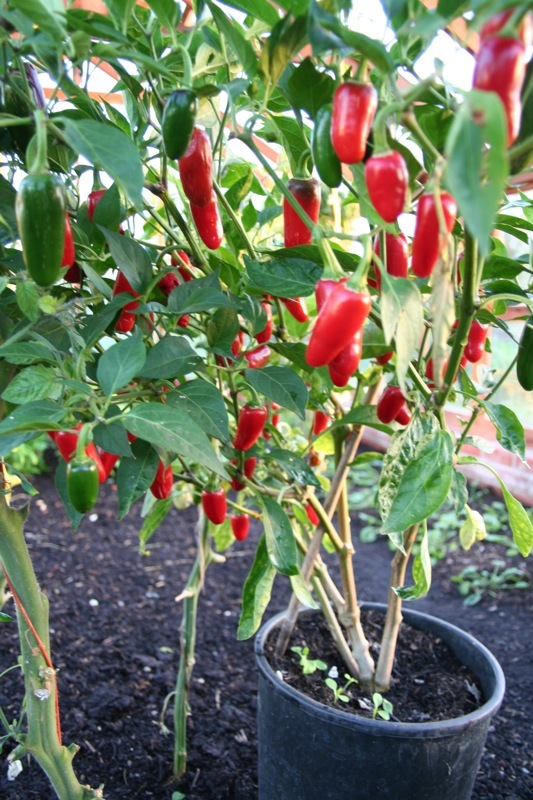 In the photos below is a two year old chilli plant, and a bed of oca that grew from six small plants. 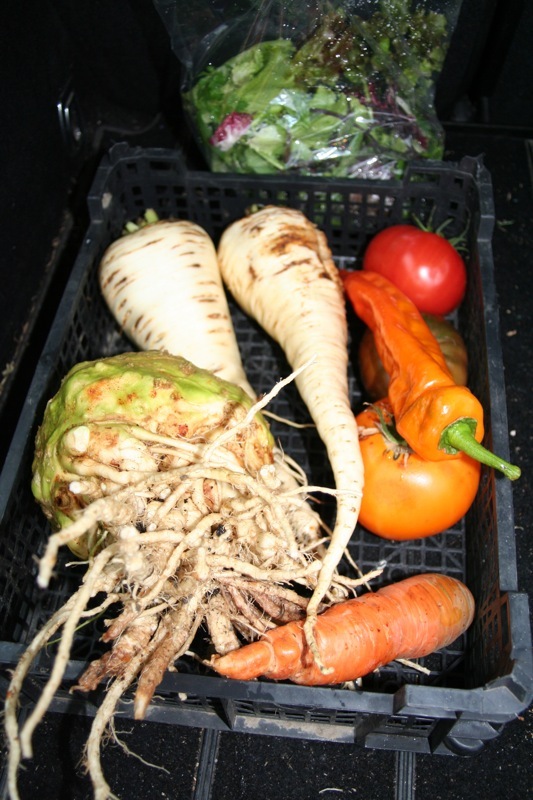 Root vegetables resist frost more or less, in this order: parsnip (most resistant), swede, celeriac, beetroot, carrot, turnip and radish. This reflects their water content: the densest, driest roots keep best when frost deepens. So you want to harvest the last three by the end of October, while beetroot and celeriac will be alright in the soil if its a mild winter. A risk of leaving them outside is rodent damage, whereas they keep well in boxes or sacks. PS yesterday 16th I noticed first damage from carrot root fly. If yours were uncovered, and have it, they will not store for so long and need eating soon. 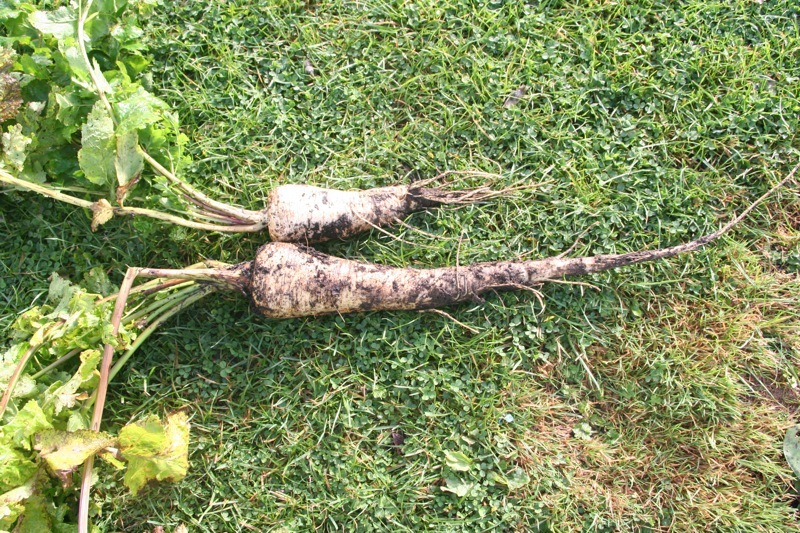 Most parsnips in undug soil go deep, while a few don’t! these are Gladiator. Any lingering squash such as butternuts are unlikely to ripen much more in the damp, cooler weather and shorter days. Unripe squashes, with soft skins and less colour, taste less sweet and are best eaten now or soon, as they don’t store for anything like as long as ripe fruits. I still have a few dry beans to pick, when there is a dry afternoon – pods are mostly yellow now. Greener pods with fat beans can be picked for eating straight after shelling the beans out, and they are delicious. Make final harvests just before any forecast of frost. Here we harvested most of the borlotti beans in early October, just before the rain. The crisp pods were easy to shell out, by spreading them over a sheet on concrete and walking on top. Then its a question of winnowing in a breeze, from one bucket to another. 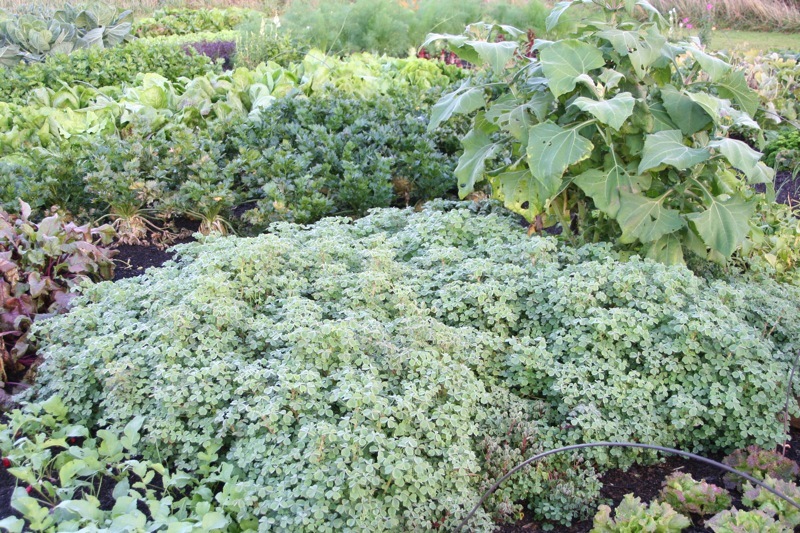 Salads undercover are one of my main winter harvests and we have almost finished clearing the polytunnel and greenhouse of summer plants, then planting for winter with salads. I go out most evenings to check for slugs and have been dismayed by the numbers of woodlice, which are nibbling some leaves, especially spinach. Usually the damage is worst on recently planted and small leaves, so I hope that growth will soon be too strong for woodlice to make much difference. Steph helped to plant one morning and took the photos below. 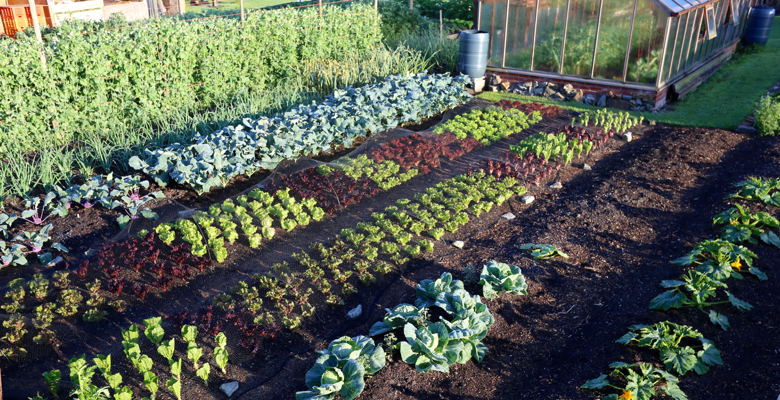 Some pics here of a summer lettuce bed still cropping mid October, winter squash drying, mushrooms to pick and mustard for green manure. Its a great season for mushrooms, moist and warm. Undug soil grows plenty, and I am rarely sure if they are edible, but in my polytunnel is a lovely fungal thread of field mushrooms which I have been harvesting for over a year, in slightly different places. The only drawback is that they encourage slugs! Suddenly the weather changes, daylight becomes scarce and a long-lingering summer is over. September was wonderful this year and was warmer than August (very unusual) albeit very dry – just 15mm here in the month. On clay soils, plants have been mostly coped well after a damp August, but I imagine it has been difficult on light soils. The main jobs for this month are harvesting, clearing, weeding and compost-spreading, the latter as space becomes clear. On new plots with lots of weeds, its a good time to lay or spread mulches, after clearing any woody growth and digging out dock roots. 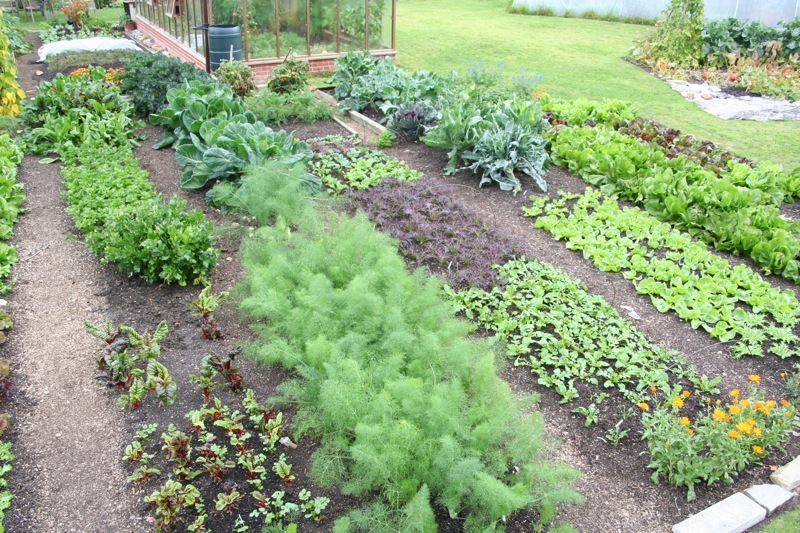 All of my garden is currently full, because I grow so many autumn salads, with nowhere yet to plant garlic. Second plantings made in July and August have grown incredibly well, such as beetroot, purple sprouting broccoli, fennel and celery. 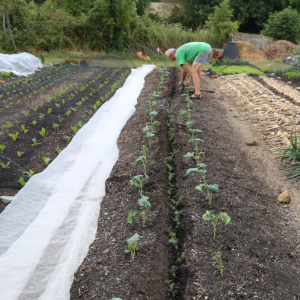 Final sowings of salad are just possible now if you have not already, but only for growing undercover, such as fast-growing mizuna, salad rocket, leaf radish and Grenoble Red lettuce. I have many module-raised plants coming ready over the next three weeks, to plant after clearing tomatoes, basil etc. 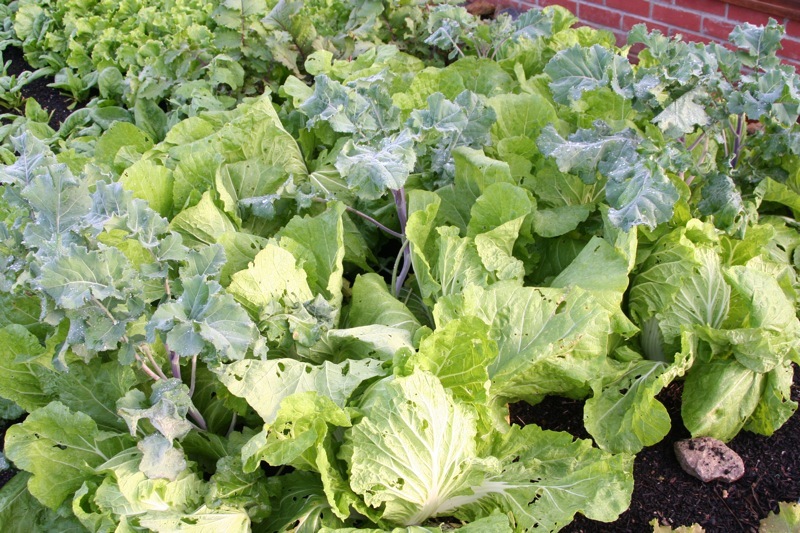 I cut or pull out the summer vegetable plants, then use my feet to tread soil down and break up any larger lumps, then water thoroughly. When watering dry soil, its best to do it in stages so that water can soak in rather than run through, on successive days for example, or with a couple of hours between waterings. I aim for fully moist soil before planting. As an aside, the photo at bottom is Uchiki Kuri squash, just one plant on the hotbed made in January (not hot any more but rich), and this plant has grown 14 large squash. Its been much easier than usual to save seed, in dry conditions. If you have left some French bean pods unpicked, they can be gathered now, once showing yellow. They don’t have to be bone dry, just leave pods on a sunny windowsill or in the greenhouse for a week, and then shell out the beans. Runner and French bean seeds to eat are in full flow, I am doing big picks of Borlotti beans at the moment. Comparing harvests of Czar runner beans, for dry beans, on a dug bed and an undug bed shows little difference so far – I do think you can save a lot of effort with simply some compost on top, rather than digging a big trench for beans. If your potato harvest was good and plants had been healthy, you can keep medium size tubers for planting next spring. 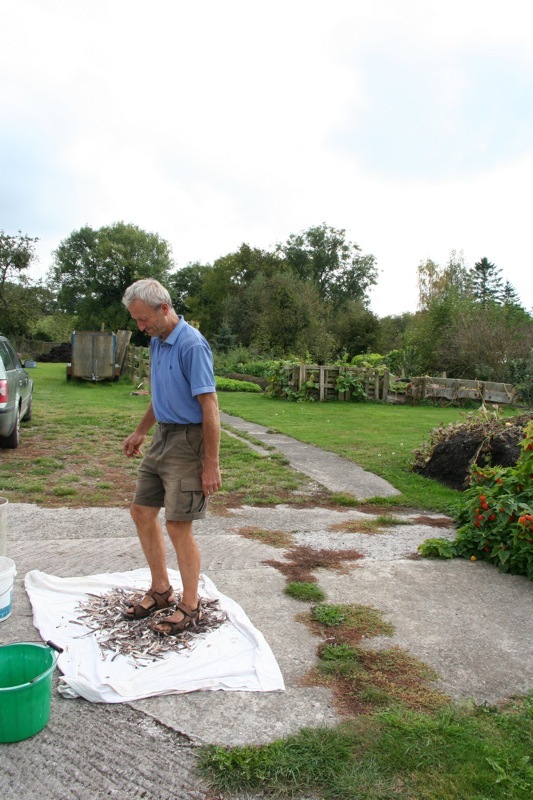 The photo above shows a day I attended at Capel Manor with forty varieties of potato harvested to assess their growth. In the photo is potato guru Colin Randel on right, and on left is Ceri Thomas, editor of Gardening Which? magazine. 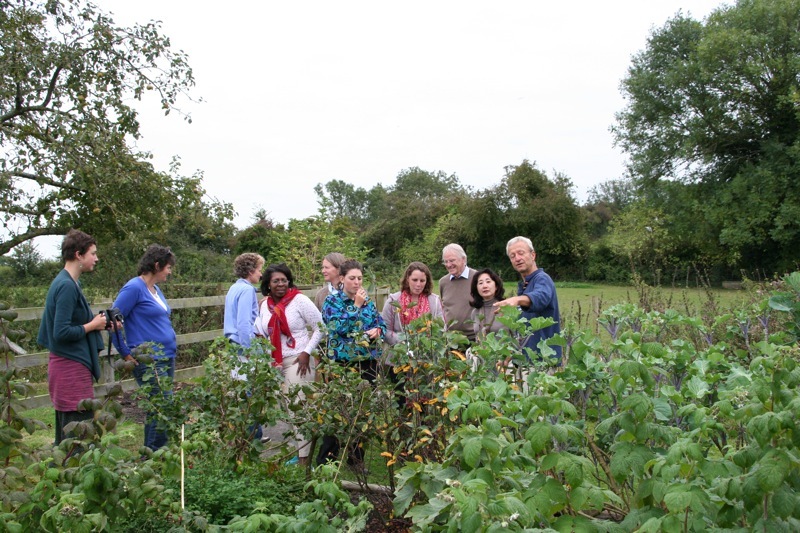 Courses here have been going so well, its lovely to see the enthusiasm in peoples’ eyes after a day of learning.I teach simpler ways to grow food, sometimes wondering how it became so complicated. 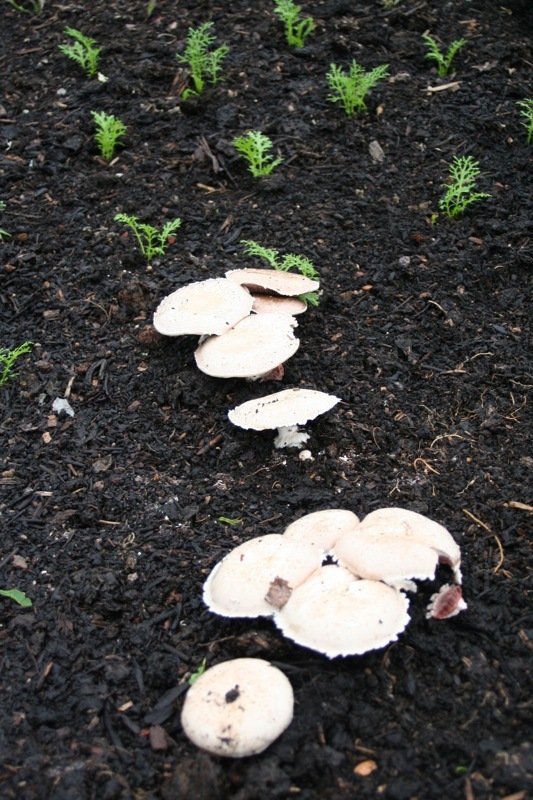 The absence of weeds in a compost-mulched garden is one of the many benefits, and time saved in not having to weed enables you to do so many more interesting things. Another great aspect to course days is Steph’s food, with all the vibrant flavours and colours dancing on the table at lunchtime. 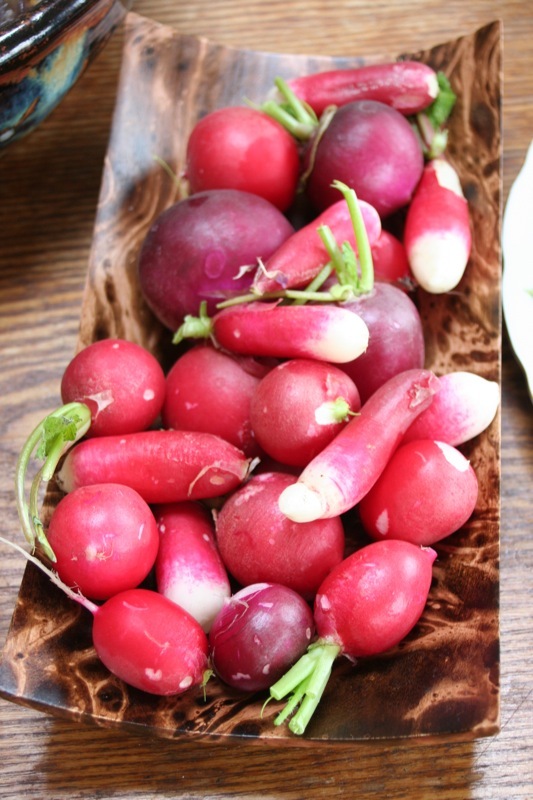 Its an encouragement to grow when you can see and taste these possibilities, all fresh from the garden. One of my favourites recently has been tomatillo salsa, with onion, melons and dressing. Tomatillos are easy to grow, suffering no diseases, but are less sweet than tomatoes: however they are also delicious in a stir fry. 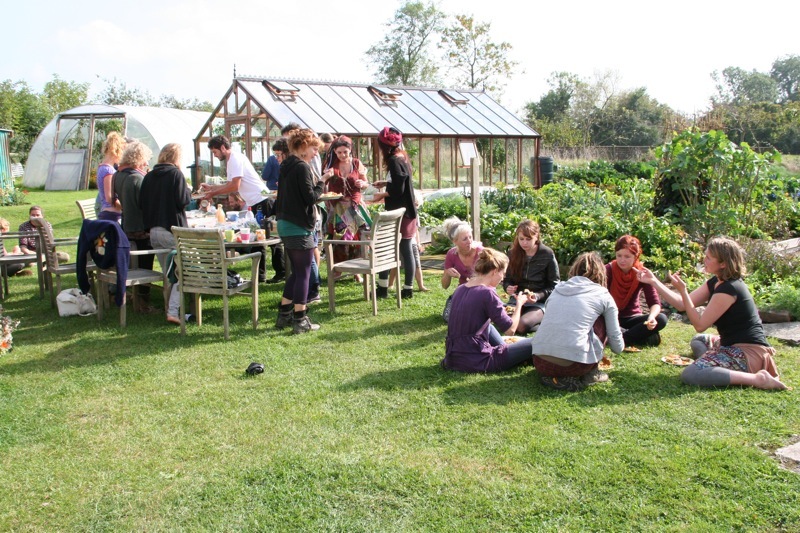 And the garden has been receiving plenty of other visitors, especially permaculture study-groups. 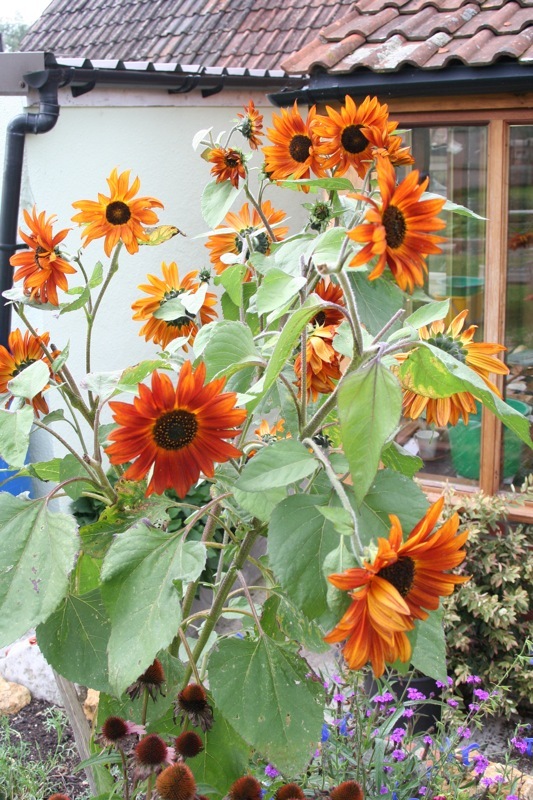 All the flowers contribute to making this food garden beautiful as well, so visitors feel doubly nourished. Celeriac has grown well here but it is the only vegetable I have watered regularly. It needs lots of moisture, and good fertility, and a long season. 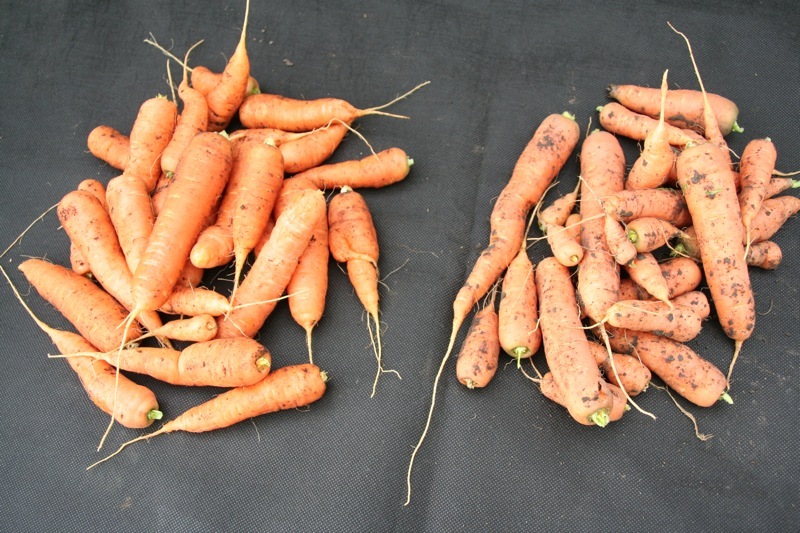 It does not like dry, light soils where you are better to grow carrots. If your celeriac roots are respectable, you have done well. 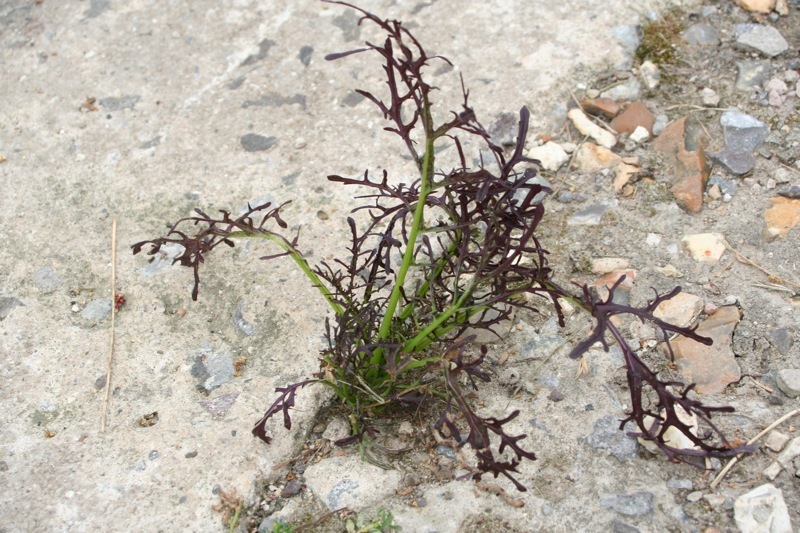 By contrast, look at the mustard above, self-sown in concrete! A few of my celeriac have recently started to show yellow and rotting leaves, an annoying disease called Septoria apicola, or late blight: its no relation to blight of potatoes though it develops in similar conditions of moist warmth. I did a couple of waterings in warm afternoon sunshine, which was my only time available (too busy picking salad in the mornings) and perhaps that was the cause. However only 5% of plants are affected and they are still good to eat.